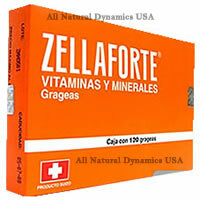 Note: Zellaforte vitamins has been discontinued. We recommend Biometrix and Vivioptal vitamins for men, women, athletes and elderly people. Zellaforte with magnesium is a high-quality multivitamin preparation with building-up effect. It activates circulation to the brain, provides more oxygen and increases memory and concentration. Retinyl acetate (vitamin A) 1000 U.I. Fatigue, over strain, vitamin and mineral deficiency; in adolescence and old age. Indications: General under performance during development in convalescence, insufficient vitamin and mineral intake, nutritional problems in old age. It is a myth that Vitamins make people eat a lot. Please contact us to give you more information.